I have climbed Mangerton on a few occasions at this stage and am always left in awe of theis wonderful mountain on our doorstep. 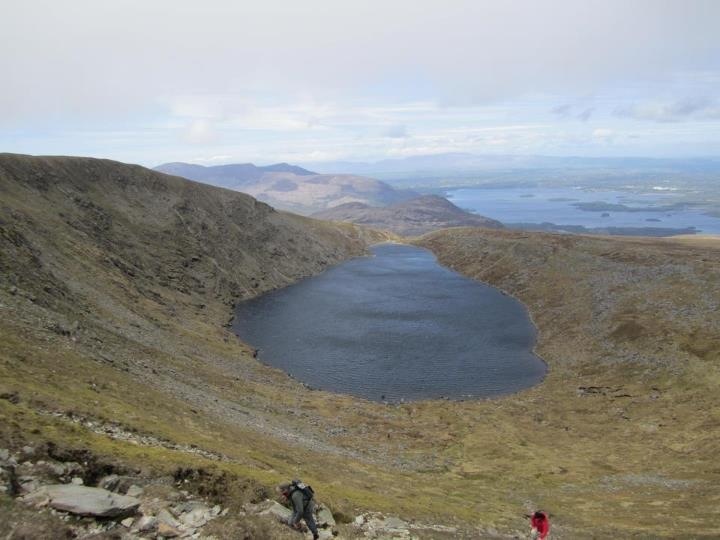 As per the other comments to get to the start of the climb, head out Muckross Road from Killarney and take the left immediately after Molly Darcy's/The Muckross Park Hotel. Head up this road to the sign for Mangerton and after another mile or so you will see the walking track veering off to the right (Point A). More than likely there will be cars parked here already but there is plenty of room here. Follow the track leading up initial section of the route up Mangerton, passing through a gate. This section can seem like a bit of a slog. Eventually the track seems to even out as you head west leading up to the Devil'sPunchbowl, with stunning views of the McGillycuddy reeks and Torc Mountain. There are the remains of old huts, possibly hunter huts, at the Punchbowl, which is a good spot to stop and have a sandwich and shelter if the wind is cold! The climb heading south up past the punchbowl is not as tough as it looks from the lake side. A short walk will bring you to the cairn at the back of the cliffs. The view over the punchbowl and right sown to Torc is sublime! This cairn is not the summit! Many people seem to think this cairn marks the summit, however, if you turn your back to the cairn, in the distance (facing south) you will spot a green stake. Head to this stake and you will see the Trig mark ahead of you which marks the summit. This is located on a huge blanket bog so gaiters come in very handy here! !